Sen. Cory Booker speaks at the TechCrunch Disrupt conference in 2012. Photo by flickr user TechCrunch used under a CC-BY 2.0 licence. Sen. Cory Booker, D-N.J., will be the keynote speaker at Commencement this year, the University announced Monday. A former Newark, N.J. mayor and a city councilor, Booker is known for his strong social media presence. In Congress, he has worked on criminal justice reform, including pushing for legislation on sentencing reform and working towards banning solitary confinement of juveniles in federal prisons. He has also gained a reputation for fighting racial injustice and economic inequality, and went on a 10-day hunger strike in 1999. “I am proud to be invited to speak to new graduates of one of the most politically engaged campuses in America who are called to serve and to make a difference in the world,” Booker said in a University release. Booker was born in D.C. to civil rights activists Cary Alfred and Carolyn Rose Booker and then grew up in New Jersey. He attended the University of Oxford and Stanford and Yale universities. 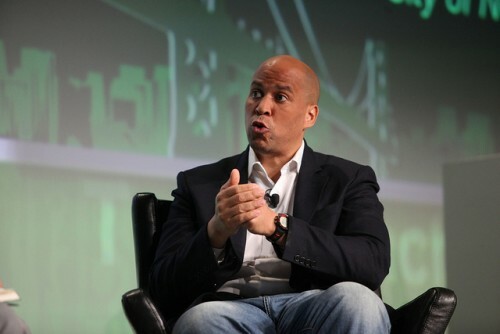 Booker accepted the University’s invitation to speak at Commencement through Snapchat, according to a University release. “He is an inspiration to the students who nominated him for this honor, and we are delighted that he will join us on the National Mall to inform and inspire our graduates,” University President Steven Knapp said in the release. Booker has spoken at GW several times, including with First lady Michelle Obama in 2013 and at a College Democrats event the year before. The Commencement address will take place on the National Mall on May 15. Apple CEO Tim Cook gave the address last year and celebrity chef José Andrés spoke on the National Mall in 2014.